Given the Nazi emphasis on the maintenance both of pure blood and the body of the German volk, it should surprise no one that the Nazis had a special interest in reshaping German medicine. In the early months of Nazi rule, doctors who were Jewish, women, or politically suspect were quickly dismissed from their positions, leaving many open positions for doctors who could prove they held the correct ideology. Party membership among doctors quickly swelled. Nazi medicine had a mission distinct from that of medicine in the rest of the world. Conventionally, the doctor’s first responsibility is for the welfare of the individual patient. But Nazi dogma held that the doctor was instead responsible for the preservation of the German race, with a mission to seek out and destroy biological threats to the strong, pure members of German racial community. Throughout Germany in the 1930s, exhibitions with titles like “The Miracle of Life” were held to preach the Nazi gospel of racial purity and to warn against those diseased and inferior elements that were supposedly threatening to overwhelm it. 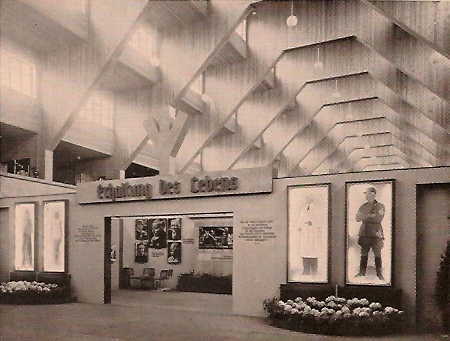 Though the message of these exhibitions tended to emphasize the ostensibly positive outcomes of Nazi eugenics policy, the implication that the “genetically inferior” were a disease element in the body of the volk formed the basis for Nazi policies of mass extermination. And as can be seen in the picture, the physician was meant to have a place, alongside the soldier, in the struggle to remove those diseased elements that inhibit the flourishing of the pure German man. The practical roles Doctors would play in this struggle were several. Obviously, Germans of pure blood were to have the finest medical care in the world, with high technology treatment for their ailments. For such Germans, the medical profession wouldn’t have appeared to have changed all that much. True, their family physician may have lost his position/fled the country/ended up in Dachau, but the day to day interactions with health professionals would have appeared normal. For those unlucky enough to be considered impure or diseased, Nazi medicine took on a less friendly character. In 1934, the Nazis set up special courts to handle the cases of “life unworthy of life”. Doctors drew up lists of those among their patients they considered genetically undesirable. Such persons were ordered to appear before the health court, where they would usually be ordered to submit to surgical or chemical sterilization. At first, a single appeal was granted to a higher health court, but a 1935 amendment to the law allowed the higher health court to summarily dismiss appeals without examining the case. The law also permitted the use of force against those unwilling to be sterilized. At the same time, Nazi doctors were called upon to perform other services to the Reich, like observing torture sessions. A directive from Gestapo Chief Heinrich Muller ordered that a doctor be present at any interrogation which subjected a prisoner to more than twenty blows from a truncheon. Later on, when Hitler decided that Germany needed a faster means of removing its failed human specimens from the body of the volk, Doctors participated in the T-4 euthanasia program. (The program was named after the address of its headquarters, Tiergartenstrasse 4, in Berlin. The building that housed the program is gone, but there is a memorial marker at its former site.) The program called for various hospitals around the Reich to be equipped with gas chambers and crematoria for the purpose of “euthanizing” inferior people. Doctors were required to fill out forms on their patients, evaluating them for possible euthanasia on the basis of genetic history, mental and physical health, and racial background. A board was meant to evaluate these forms and give a final verdict. However, this procedure was not always followed. Frequently, the staffs of T-4 clinics took it upon themselves to murder their patients without first filling out all the paperwork. Since the program always explained patient deaths as the result of accidents or illnesses, it was easy to get away with skipping the required clerical work. Other doctors, seconded to the concentration and extermination camp systems, found other ways of eradicating undesirable racial stock in ways meant to benefit the volk: medical experiments. The logic behind these experiments was that, since the inmates of these camps were expendable, it was better to gain research data from their injuries and deaths than it was to simply murder them. These data would be used, variously, to provide support for Nazi racial theories, to test new drugs, or to learn how much stress a human body could withstand (under various war-related circumstances). Doctors in the camps were also responsible for managing the “selections”, which, in those camps with a captive labor force, meant segregating those suitable for work from those who were to be immediately killed. Though Nazi doctors hid the uglier side of their work from public view, they seldom did so out of shame. Nazi doctors thought of themselves, in all seriousness, as the vanguard of National Socialism. They were biological soldiers stamping out diseases that afflicted their race. Their ability to reclassify disliked human beings as a kind of bacillus enabled Nazi doctors to commit the most appalling, sadistic crimes in the name of bolstering the miracle of life.